Emirates, voted the World’s Best Airline in the 2016 Skytrax World Airline Awards, announced today that it will operate the first ever scheduled commercial Airbus A380 flight to South America when it upgrades its Dubai (DXB) – Sao Paulo (GRU) service on March 26, 2017. Replacing the existing Boeing 777-300ER used on this route, the A380 service will mark the airline’s 10th year of operations in Brazil, which it began with daily flights between Dubai and Sao Paulo in October 2007. Back then, Emirates had already made history becoming the first airline to connect the Middle East and South America with a non-stop direct flight service. In 2012, Emirates expanded its presence in Brazil with the start of a daily service between Dubai and Rio de Janeiro. “The Emirates A380 is an iconic aircraft that continues to excite our customers and set the benchmark for travel comfort in commercial flying. We look forward to offering the award-winning Emirates A380 experience to our customers and to continue contributing to the economic success of Brazil,” said Hubert Frach, Emirates Divisional Senior Vice President, Commercial Operations, West. “The switch to the A380 offers a total of 959 additional seats per week in each direction meeting a growing demand from travellers on the route and demonstrating our commitment to Brazil and to the South American region”. “We made significant investments to upgrade the facilities at GRU Airport – São Paulo International Airport in order to make it A380-compatible. We are very excited about Emirates’ decision to deploy the first A380 in South America to our airport“, said Gustavo Figueiredo, GRU Airport CEO. Sao Paulo will join more than 40 destinations on Emirates’ global network served by its highly popular A380 aircraft, including Narita (commencing March 26, 2017), Bangkok, Hong Kong, Beijing, Taipei, Seoul, Shanghai, and Guangzhou. The introduction of Emirates’ A380 service from Guarulhos International Airport, Sao Paulo, makes it possible for Brazilian travellers to fly only on A380s to their final destinations, particularly when to travelling to Asian cities, via Dubai. Emirates SkyCargo, the freight division of Emirates, facilitates trade between Brazil and its global trade partners. In addition to the cargo capacity offered on the A380 to Sao Paulo, Emirates SkyCargo also operates a freighter twice a week from Viracopos carrying Brazilian exports to other global destinations. From March 26, EK261 will become an A380 flight, leaving Dubai (DXB) every day at 08:35 and arriving in Sao Paulo (GRU) at 16:30. The return flight, EK262, departs Sao Paulo (GRU) at 01:25 and lands in Dubai (DXB) at 22:55. Recently in October 2016, Emirates announced a codeshare and frequent flyer programme partnership with GOL Linhas Aéreas Inteligentes S.A (“GOL”) allowing customers to purchase connecting flights on both airlines using one reservation, and a seamless ticketing, check-in, boarding and baggage check experience during the entire journey. Passengers booking flights from multiple destinations in Brazil with GOL, including Porte Alegre, Salvador, Belo Horizonte, Curitiba and Brasilia, will now be able to connect in Sao Paulo and fly the Emirates A380 to many destinations worldwide. Emirates is the world’s largest operator of A380s, with 92 currently in its fleet and a further 50 on order. Since 2008, the airline has carried over 65 million passengers on its flagship aircraft. 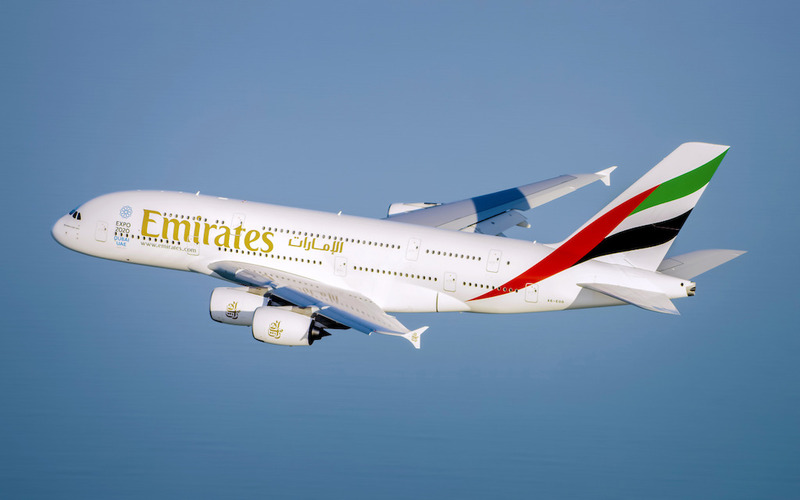 Emirates will deploy its three class A380 on the Sao Paulo route, offering a total of 491 seats, with 14 private suites in First Class, 76 lie flat seats in Business Class and 401 seats in spacious Economy Class cabin. The Emirates A380 is renowned for its First Class Private Suites and Shower Spas, as well as Onboard lounge for First and Business Class passengers to mingle whilst enjoying canapés and beverages prepared by the onboard bartender. Passengers in all classes can enjoy Wi-Fi to stay in touch with family and friends or Emirates’ multi-award winning ‘ice’ Digital Widescreen with more than 2,600 channels of movies, TV programs, music and podcasts. Passengers travelling on the Emirates A380, will enjoy spacious cabins and experience a peaceful journey in the world’s quietest long-range jet. Emirates’ premium onboard experience is complemented by on-the-ground comfort with a network of 40 dedicated Emirates Lounges located within major airports around the globe – all designed with the same attention to detail and exceptional service. Emirates this year completed a US$ 11 million refurbishment of its Business Class lounge at Concourse B in Dubai, which now includes a barista experience, a health hub with Voss water, and an exclusive Moët & Chandon champagne lounge. First and Business Class passengers can also travel to and from the airport via Emirates’ complimentary Chauffeur-drive service available in Sao Paulo, Dubai and many other airports across Emirates’ extensive network. Those travelling to Dubai will find many different activities to experience. The city offers everything a visitor could want, from shopping at some of the largest malls in the region to dining options which will spoil anyone for choice, a trip to Dubai is a must for families, friends and individuals. Dubai has seen the addition of several new attractions in the last year. Among the latest must-see places in the dynamic city are Dubai Parks and Resorts which features three distinct theme parks – Motiongate™, Bollywood Parks™ and LEGOLAND®. Spread over 25 million square feet, and equivalent to 420 football fields, the parks combined have more than 100 rides and attractions. Other tourist hot-spots inaugurated in 2016 include IMG World of Adventures – the largest indoor theme park in the world and the Dubai water canal – a 3.2km long waterway which winds its way to the Arabian Gulf from the Creek in Old Dubai. All travellers can take in the sights of the Burj Khalifa, the world’s tallest building, the Dubai Fountain which dances to a set of music for onlookers, and of course, experience desert camel rides and dinner under the stars at a Bedouin style camp. Dubai truly offers a variety of attractions to meet the tastes of business and leisure travellers alike.